How perfect are these bangles for mom!!! Stamp each charm with something special. 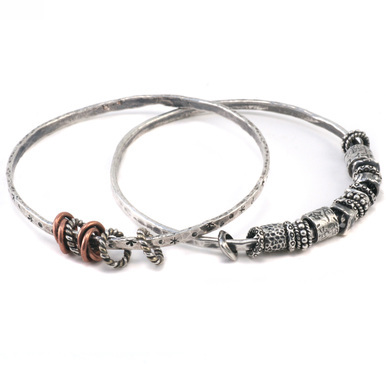 Fuse your fine silver wire into a bangle. Check out this online class before you start! Lightly shape with the Plastic Mallet on the Bracelet Mandrel. While still on the bracelet mandrel, add texture to each bangle with the hammer of your choice! 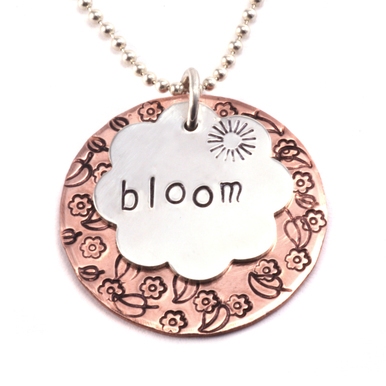 Stamp your designs and/or initials on all your pendants and blanks. Punch holes in the blanks and attach to the bangles with your jump rings. Oxidize in Liver of Sulfur. Follow up with a Pro Polish Pad. Check out this great tutorial before you start! 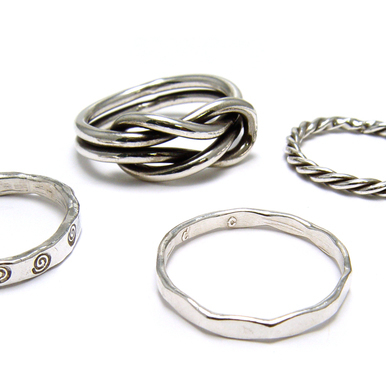 Attach your charms with a jump ring. Fancy Uppercase Letter Stamp Set 1/4" (6mm) - ETA JULY 2019 - $70.00 - "N"
USA Made Block Uppercase Letter Stamp Set 1/4" (6.4mm) - $92.00 - "A"
12g Fine Silver, Round, Dead Soft Wire - 1/2 oz (~1.58 ft) - $19.25 - If you want to make 4 bangles you will need 2 packs of this wire.